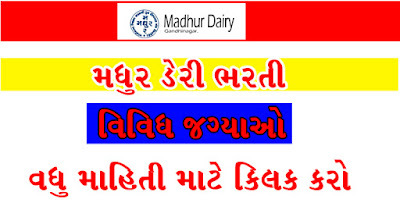 Gandhinagar Madhur Dairy Has Published Notification for Various posts Recruitment in Various Fields. The Candidates have biggest opportunity for the JOB in Gandhingar Madhur Dairy. Gandhinagar District Co-Operative Milk Producers Union Limited is the Gandhinagar districts Most Powerful Milk Producer company. Eligible and interested candidates may walk in on Dates 25/08/2017 & 26/08/2017.Candidates are advised to read official notification carefully before applying for this post.Hare is Various Posts Job Notification In Madhur Dairy Of Gandhinagar. • H.S.C. Pass and Gujarati/English Steno Exam Pass. • B.V.Sc. & A.H. from a recognized university. Educational Qualifications And Work Experience : Please Read All Details In Below Given Notification.